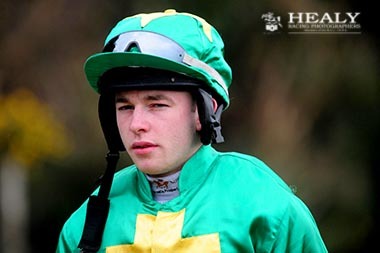 Wexford-native Kevin Corrigan has been enjoying a fine season to date finishing in the frame on nine of his 22 rides this term, with three winners on the board. The 20-year-old is in his fourth season riding and with almost 80 rides to his name, Corrigan is quickly amounting plenty of experience. With the backing of leading handler Denis Murphy, his brother Martin and a number of local trainers, Kevin is certainly a novice rider going places. Are you from a racing background? I grew up with racing, one of my uncles used to train and my brother Martin trains a few at home now as well. I would have started out hunting and hunter trailing. How did you become involved in the racing side of things? I started riding out at home first and then when I finished in school I went to work for James Doyle. I started with Denis Murphy about a year-and-a-half ago and things have been going great in there. Do you school or ride out for anyone else? Bernie Murphy would come in schooling and working horses in Denis’, so I would do a bit for her. I give my brother a hand with the horses at home and school for a few other local lads as well. You ended up riding your first winner by default at Killeagh last January? I actually finished second on the day, but the winner was disqualified afterwards, so it ended up being my first winner on paper. My first proper winner was actually in Borris this year on a horse of Tom Power's for Philip Rothwell. That must have been a great day at Borris? It was brilliant day alright, I know the owners well. I have had a good season since, riding another couple of winners. One for my brother and another for Bernie Murphy. You rode a nice Jeremy mare to win at Lingstown last week? Yeah she was very good, she went over to the Cheltenham Sale afterwards and made £80,000, so it was a great touch for Bernie and owner Pat Coffey. It is great to see horses you have rode going on and making money like that. You must be delighted that Denis is starting to give you opportunities as well? It’s great to be getting a few spins from him, I had two rides for him last Sunday at Ballyarthur and they both ran well, finishing fourth and second. I will stay riding in point-to-points, I would like to get involved in a couple of horses with my brother as well in the future. What improvements would you like to see in point-to-pointing? To be fair the novice riders races are a help, they are a big asset to young lads starting off. If you can ride a few winners in those types of races, people will start noticing you and it’s definitely a help to get more rides. How about another rider you think might be up-and-coming? There is a lad in Denis’ with me, Conor Smithers. He has been getting a few spins from Denis and he could be one to watch out for. Is there a trainer we should be keeping an eye on? My brother Martin is training full time, I give him a hand a few afternoons a week, schooling and riding work. He has around eight in, we only have a small set up with a cheaper type of horses but we do our best with what we have. He has had a few four-year-olds placed and anything he runs tends to run well. Any horses we should be watching out for? Martin has a few nice horses around, he is also involved with a four-year-old mare with James and Ellen Doyle called Methodtothemagic, she was third last weekend and we think she can go on to bigger things. Who has been your biggest influence in racing or who would you look up to? You couldn’t go too far wrong trying to base yourself off the likes of Jamie (Codd) and Barry (O'Neill). Do you do any sport outside of racing? I hurl away with my local club Blackwater. I think it’s important to talk well and be decent to everybody you meet.